I just missed him apparently. Back in 2006, somewhere within Kathmandu’s narrow maze of streets, I met a Romanian cyclist called Cornell. Nepal’s capital is, or at least was then, something of a hub for touring cyclists in the Indian subcontinent. Some like me had crossed the border from Tibet, whilst others had entered from India or Bangladesh. Well there had been a group of us exchanging tales and I remember him telling me he would be cycling Cairo-Cape Town in the future. He left me with his e-mail address, but never replied when I later contacted him. Fast forward some years later and here he was, or just had been, in Lilongwe. “He go yesterday”. “We cycle together”, said Tokuru, a tiny Japanese man about to pedal off somewhere into the city. “I need to find new tyre”, he said showing me the ripped rubber on the walls of his front tyre. I later thought back to my time in Kathmandu. That Romanian cyclist, who I was never going to forget on account of the fact that he spent his week in Kathmandu having a trailor made to transport an enormous wooden scuplture, had given me a spare tyre. For the last 15,000km in Africa I’ve been carrying two! 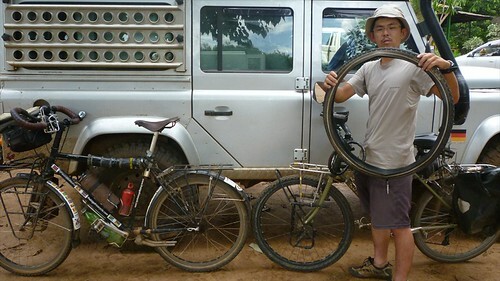 I returned the following day and gave Tokuru one of two Schwalbe XR folding tyres. “Sugoi desu” ’ (It’s amazing) came the reply. Well I hope the tyres I’m running and the one remaining are enough to take me the 5000+ kilometres that I estimate to be left on this journey. The plan from Lilongwe had been to head towards Zambia, but for several reasons I’m now in possession of a Mozambican transit visa and about to return there en-route to Zimbabwe. One reason is that the Mozambican visa, short as it is, (3 days) was cheaper and could be paid for in Kwatcha and picked up the same day from the embassy in Lilongwe (Zambian visas reportedly have to be paid for in US $, which I don’t, or didn’t at the time possess). 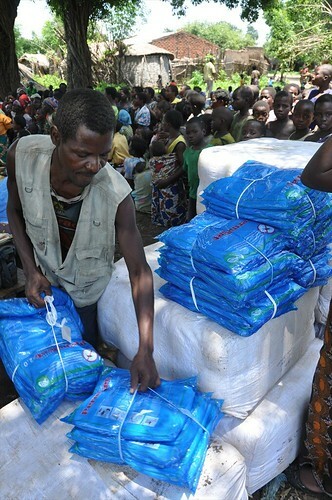 The second reason was that the mosquito net distribution using nets funded by people supporting the Against Malaria Foundation through the Big Africa Cycle, was taking place south of Lilongwe on the way towards the Mozambique border. 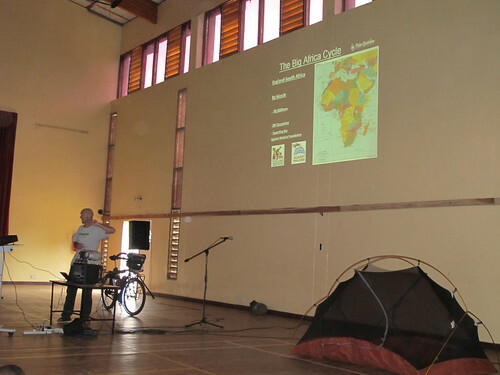 I had also heard from other cyclists that the road I into Zambia was pretty dull to cycle. I didn’t see Tokuru again. We weren’t staying at the same place and he hadn’t made his mind up about which way he was going, although told me he knew of seven Japanese cyclists touring Africa, including Hiromu. 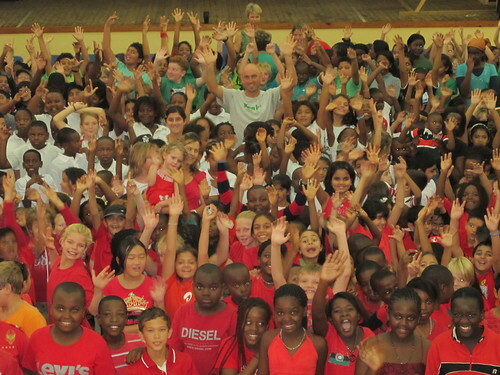 For the first time since passing through Kampala I visited an International School in Lilongwe. The welcome and reception were tremendous. Over 400 Primary School children came specially dressed in colours representing the Malawian national flag to hear me talk about The Big Africa Cycle. Two days later I returned to speak to the Senior School and was given a generous bundle of Kwatcha, which had been fundraised by the School for the Against Malaria Foundation. Unfortunately Malawian Kwatcha is not one of Africa’s strongest currencies. Outside of Malawi the only person who’d take it off you might be a Malawian, and even within Malawi changing it into a hard currency like US $ or South African Rands is near impossible. Following the departure of the British Ambassador last year there is far less foreign aid coming into Malawi (the UK made up most of the foreign aid coming to Malawi). This subsequently means far less foreign currency, which in turn explains the lack of fuel. This is my understanding anyhow. Everyone wants $ so no-one is really willing to sell them. Banks will only change the money if you have an account with them. I only discovered this latter part on the morning I was leaving Lilongwe with the uncomfortably think wad of notes in my front pannier. They stayed there, with the pannier never far from sight, for the next two days as I followed the main road south from Lilongwe. 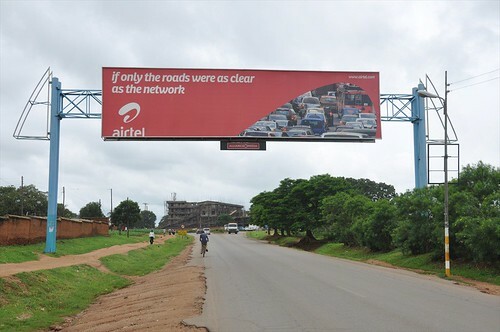 “If only the roads were as clear as the network”, read a billboard advertising one of Malawi’s mobile telecommunication companies on the way out of Lilongwe. Not sure Airtel had Malawi in mind when they thought this one up. 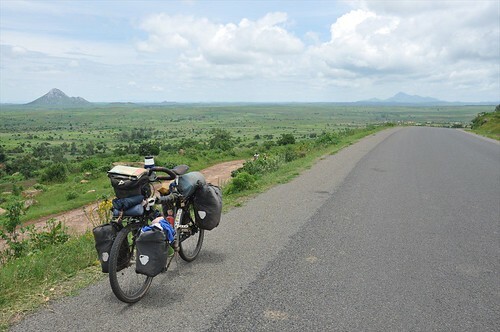 The road was typically free of motorised traffic and as well-paved and scenic to cycle as most of the others in Malawi. 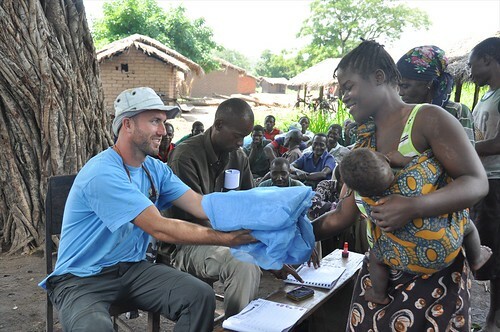 In Ntcheu I found the Concern Universal Office and spent the following two days helping to distribute a fraction of the 250,000 mosquito nets which are being handed out here. During the rainy season malaria is particularly prevalent with the surface water that provides a breeding ground for mosquitoes. Over 1500 of these nets had been funded by people who’ve donated to the Against Malaria Foundation through this website, so being involved in the distribution was important for me. The logistics of distributing such a vast sum of nets requires a great deal of time and labour. Each village and every household had been registered in a census by district health officials with the number of sleeping spaces in each household determining how many bed-nets were given out. People assembled at a designated distribution point and waited for their names to be called out, before coming forward and placing a thumb-print next to their name when they had received a net. Even with over one thousand nets being given out to several villages at a time I found the name lists and the number of nets almost matched exactly with those who were present to receive them. In order to prevent anyone from re-packaging and possibly selling the nets the plastic wrappers were collected and burnt at the end of the distribution – not great for the environment, but it seemed the best solution. In 6 months time district health officials will conduct a post-distribution follow-up to see how these nets are being used, and review the incidence rate of malaria as recorded at district health clinics since the distribution. This is the third and possibly last bed-net distribution I will be involved with, but your continued support for the Against Malaria Foundation is much appreciated. I’d like to hit £20,000 as a fundraising total, so there is some way to go. Fortunately I managed to dispense with the bundle of kwatcha in Ntcheu by handing it over to Concern Universal. They will pay it into the local bank from where the $700+ will be transferred to Against Malaria in the coming weeks. What has happened to your trip, havnt seen any updates. Is this THE END of your blog Pete???????????? Not at all. Well you can read the latest and long-delayed blog post to catch up. More to come within the next week. 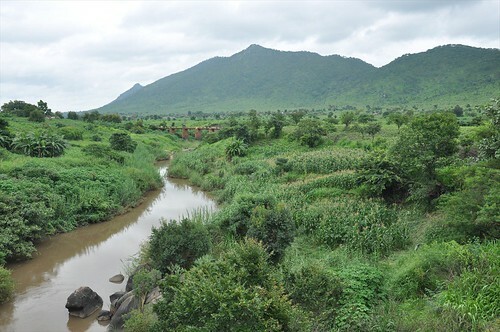 Great to see more photos of rural Malawi. Those views bring back beautiful memories of the “warm heart of Africa”. The International school, Bishop Mackenzie, was my first school back in the 1950/60s (I participated in the renaming ceremony from “lilongwe European School!”). Your top photo has Bunda Mt in middle distance and Likoma mt behind. The bridge over the river in your other photo is one of the old main highway single lane “high level” level bridges with only a curb stone to stop vehicles running off the edge! In eastern Uganda bednets found a ready market as bridal veils! But overall the insecticide impregnated nets have been a huge success in Africa and malaria has been vastly reduced in some areas. Don’t you find the name for a bicycle in Chichewa, “Njinga”, describes the sound of a bicycle bell and is quite appropriate. 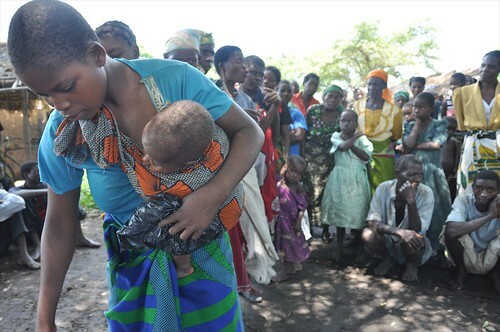 Are you crossing the Tete corridor through Mozambique to Zimbabwe? Bon voyage! Pete, why did you chose to go through Zimbabwe instead of just Moçambique? Just curious. With all the violence against white people I thought Zimbabwe was a bit unstable. But you’ve done the DRC, so probably not as dangerous. Surprisingly, the FCO does not have any restrictions on travel to Zimbabwe, although the Australian government has it at ‘reconsider your need to travel’. Good stuff Peter. The picture of your bike on the road with the flat lands in the back is splendid. Hi from New Zealand Peter. I always remember the story that probably you should know about mosquito nets distribuition that I heard while I was in Africa. 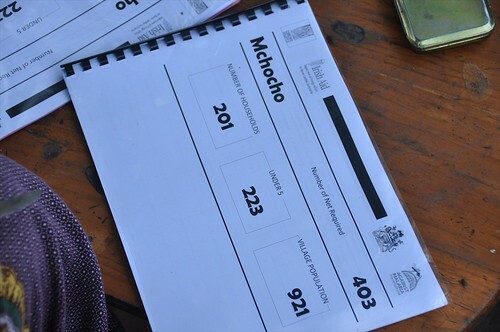 It happened in Mozambique. 1 year later an Ong did a distribution of mosquito nets in a village they came back to see how they were using them. And they couldn´t find nobody that had the mosquito net at home. Theye were using them for fishing!!!! Eating is first than Health in Africa. You are doing a great job with each mosquito net, and i hope your parteners on the field can teach them how to use it. Malaria kills more people than HIV, isn´t it?. Hi Alvaro, I know this story and it’s not just in Mozambique. Critics of mosquito net distributions often like to use this story as a reason not to give them to the rural poor in Africa. I’m sure there have been many cases of mis-used nets, but with local education iniatives and close monitoring, rather than just giving out the nets with no accountability, bed-nets can be used correctly to prevent malaria.